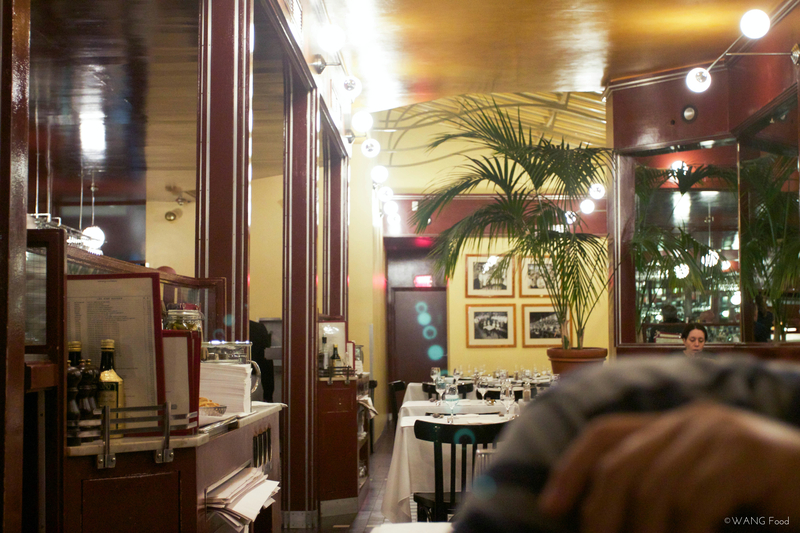 The restaurant was a bit narrower than I expected, but this created an intimate and cozy ambiance. 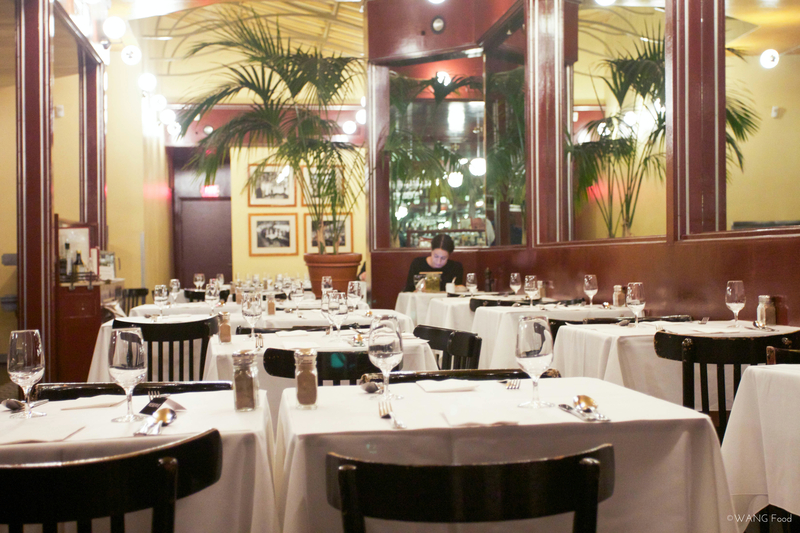 The layout of the restaurant is separated into two sections: bar area, and tables. Soon after we were seated, the restaurant began to fill up with customers, who are old enough to be my grand-parents! You could tell that they are regulars, because the staffs greeted them by their first name, and they know their way to the tables. The bread and butter were served at the same time as the waiter brought the menu. Since the menu was written in French, and cursive, the waitress kindly asked if we need an English-translated menu, and she explained the specials of the day. 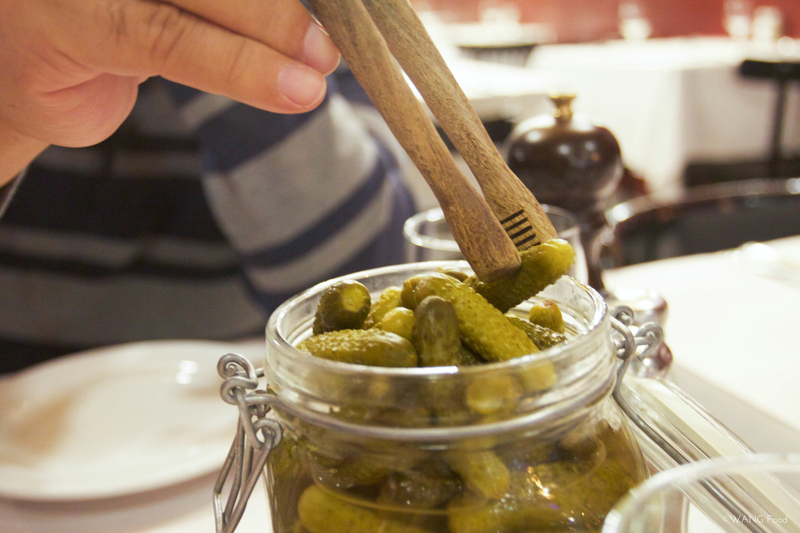 Each table is given a jar of their house made gherkins on the side, which helps to cut the richness. The sourness and acidity are well-balanced. To start off the night, we shared a soup and an appetizer. 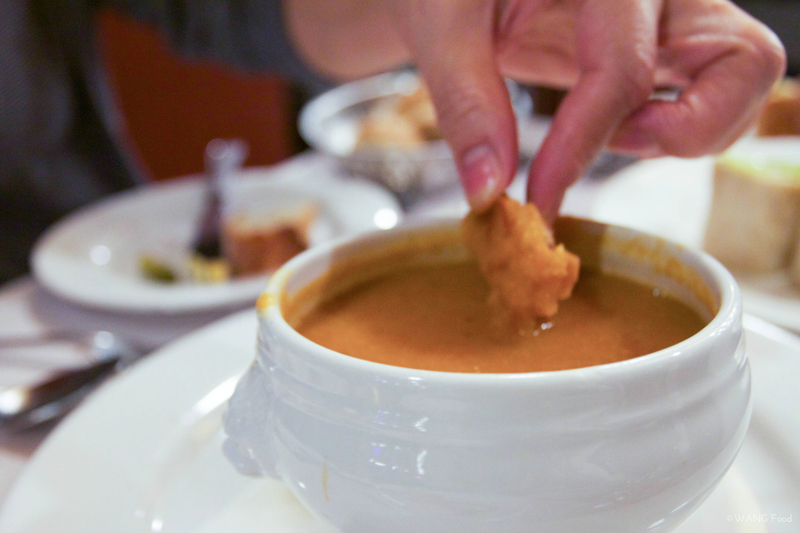 The fish soup is a classic at L’Express. It’s creamy, but grainy. It’s full of sea flavors, as we assume that there’s shrimps in there too. 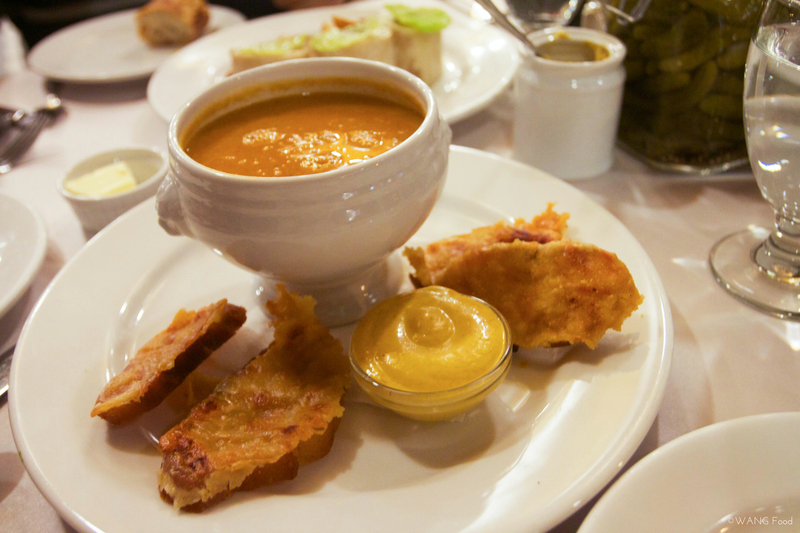 The soup is served with crispy baguette slices with melted cheese, and a mayo-based sauce on the side. I asked the waiter upon serving, what’s the proper way of eating it. 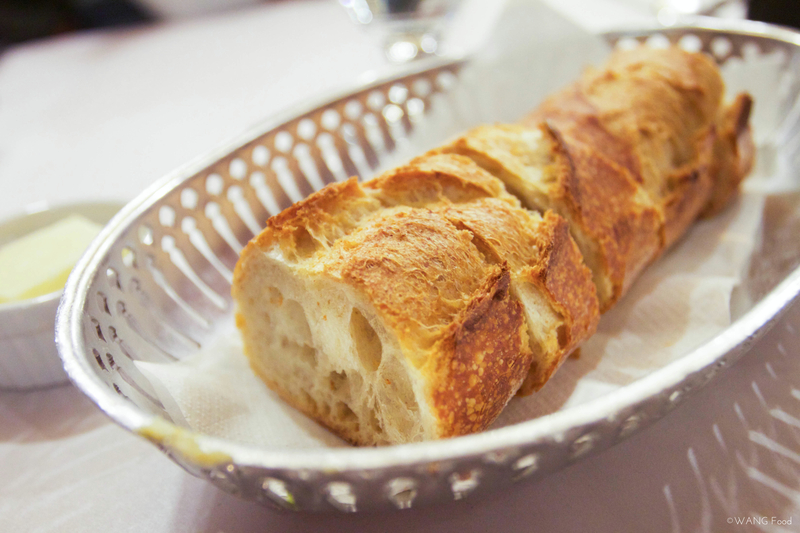 He said that some people like to spread the sauce on the baguette slice, and dip it into the soup. The cheesy baguette slices were absolute perfection when dipped in to the soup. The flavors came together, and there wasn’t anything weird about it. It’s the perfect soup for these cold, rainy days. 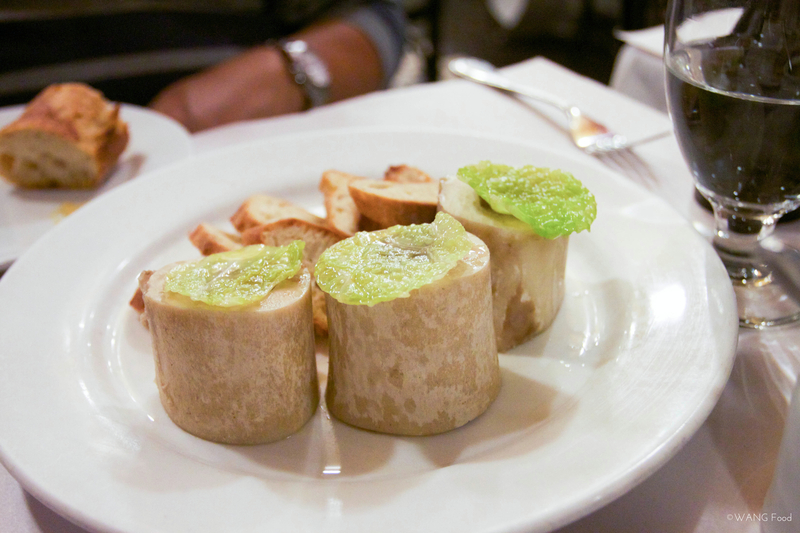 Another appetizer that we shared is the bone marrow with coarse salt, which is another classic of L’Express. 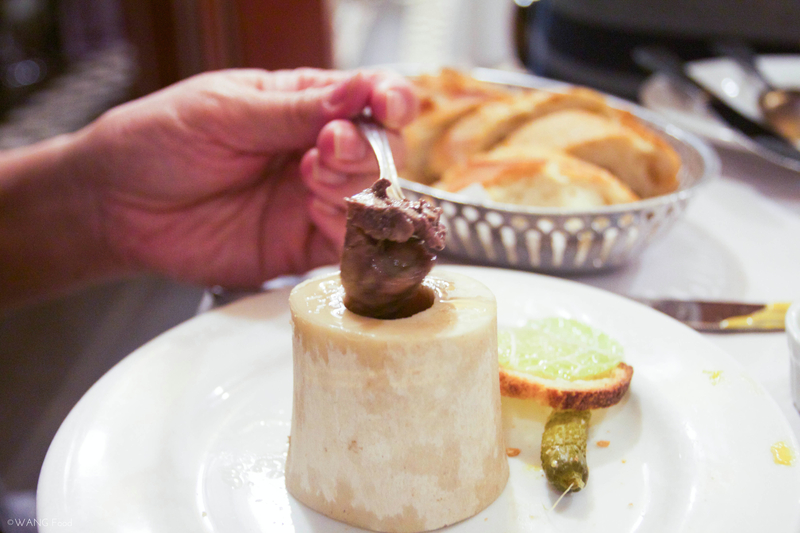 I was so looking forward to this dish, unfortunately, I did not eat it as my mom reminded that it could be the cow’s bone marrow, and she was right. You get a whole lobe of marrow coming straight out of the bone. My mom thought the marrow was rich and heavy. However, it’s one of those type of appetizers that you order for its texture than taste. 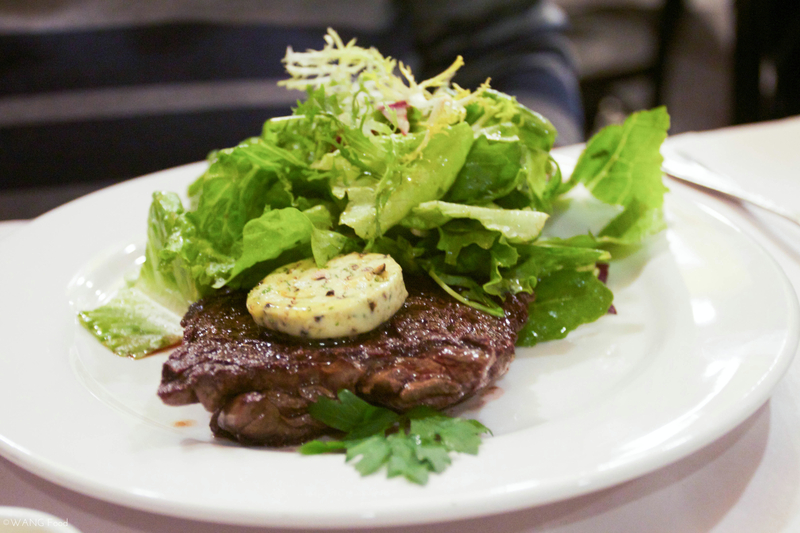 For the main, but dad opted the Hanger steak with shallot butter and salad. Though my dad ordered it medium-well, it came out close to medium. However, it was still good, according to my dad. You can enjoy the stead with either a green salad or fries. 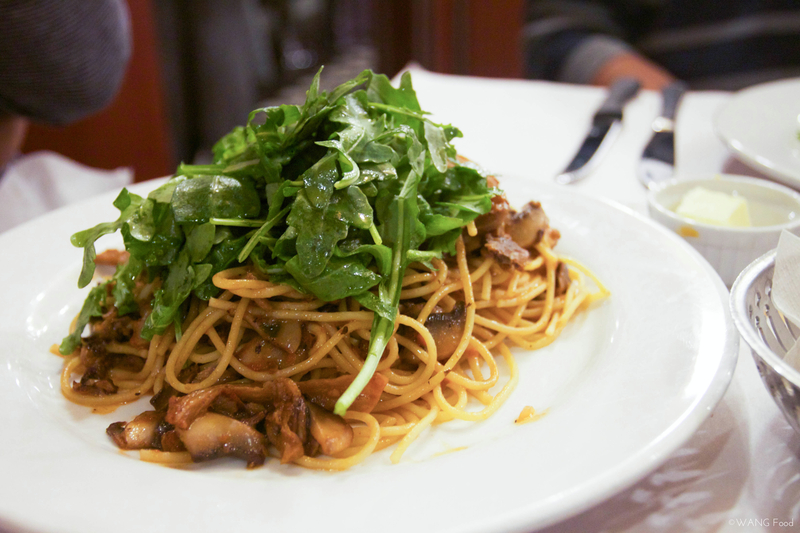 My mom settled for the spaghetti with mushrooms, as she saw a lady eating it. The portion is really generous, with a lot of mushrooms as well. I liked how the spaghetti came with a bunch of green on top. My parents only likes the traditional spaghetti, so my mom was happy with this. The spaghetti was served al dente, which is the way I liked it. However, it gets softer towards the end of the dinner, which is the way my mom liked it. 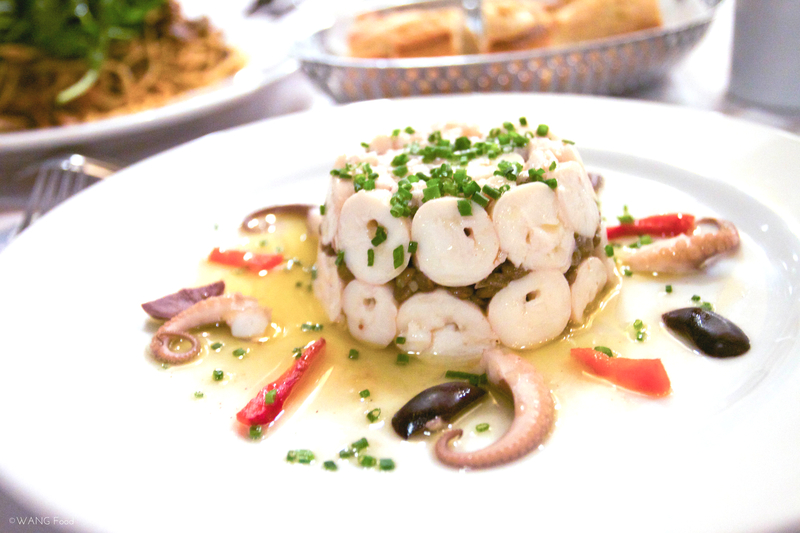 I ordered one of the popular appetizers, Octopus and lentil salad in vinaigrette, as my main. I wasn’t that hungry, so when I asked the waitress about this dish, she told me that sometimes people take it as a main. I was glad that I did too, because I knew I was going to have some of my mom’s spaghetti. The presentation of the dish was beautiful. The octopus was so tender that I felt like I was eating fish. However, the dressing was a bit bland. I wish the vinaigrette could stand out more. L’Express opens for business as early as 8 AM on weekdays (10 AM on weekends), and closes at 3 AM on weekdays (2 AM on weekdays)! From breakfast to late nights. Perfect spot for any meals at any times of the day. 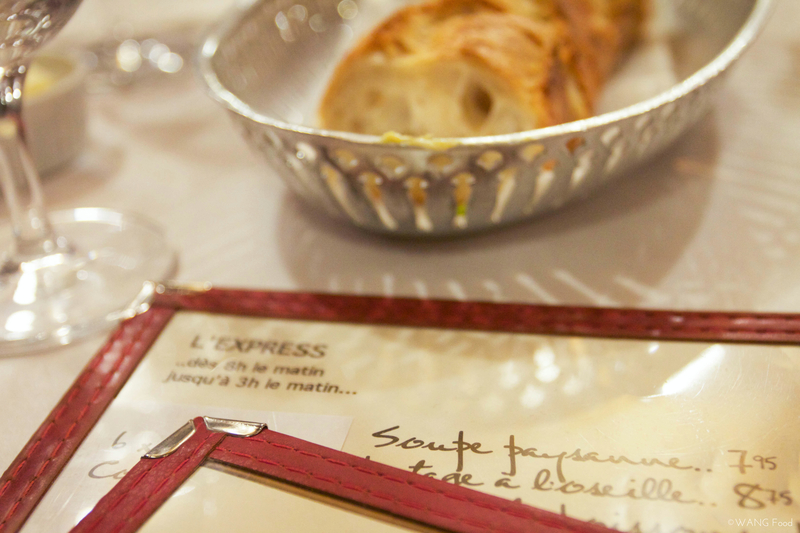 I would definitely recommend this for any first time visitors who want to experience traditional french bistro food. This entry was posted in "Eat"away, Montreal and tagged Fine Dining, French cuisine, Montreal, Plateau Mont Royal. Bookmark the permalink. Food looks incredible here! I’m really eyeing that fish soup. Looks delicious as usual! Maybe you can recreate it and share a recipe!